A variety of health care practices, such as homeopathy, naturopathy, and Reiki, whose tenets often differ from those of mainstream medicine and are not generally taught in conventional medical schools. any of the systems of medical diagnosis and treatment differing in technique from that of the allopathic practitioner's use of medical therapies such as drugs and surgery to treat disease and injury. Examples include acupuncture, aroma therapy, ayurveda, faith healing, homeopathy, and therapeutic touch. Compare allopathy. See also complementary and alternative medicine. A heterogeneous set of practices that are offered as an alternative to conventional medicine, for the preservation of health and the diagnosis and treatment of health-related problems; its practitioners are often called healers. Alternative healthcare practices constitute a vast array of treatments and ideologies, which may be well-known, exotic, mysterious or even dangerous, and are based on no common or consistent philosophy. Practitioners range from being sincere, well-educated, and committed to their form of healing, to pseuodscientists or charlatans. • Alternative (formal) systems—Acupuncture, ayurvedic medicine, Chinese herbal medicine, homeopathy, naturopathy. • Body awareness—Exercise and movement therapies, e.g., dance therapy, martial arts, yoga. • Manipulative therapies—Chiropractic, Hellerwork, Rolfing. • Mental therapies—Humanistic psychology, hypnosis. • Natural remedies—Diet (e.g., macrobiotics), naturopathy. • Sensory therapies—Art, colour and music therapy. …a heterogeneous set of practices 'that are offered as an alternative to conventional medicine, for the preservation of health and the diagnosis and treatment of health-related problems; its practitioners are often called healers'; alternative health care practices constitute a vast array of treatments and ideologies, which may be well-known, exotic, mysterious, or even dangerous, and are based on no common or consistent philosophy; the practitioners range from being sincere, well-educated, and committed to their form of healing, to charlatans, deprecatingly known as 'quacks'. See Fringe medicine, Holistic medicine, Integrative medicine, Office of Alternative Medicine. Cf Unproven methods for cancer management. A general term for methods of healing, some ancient and widely practiced, which may not be firmly based on accepted scientific principles and may thereby be of limited known effectiveness. 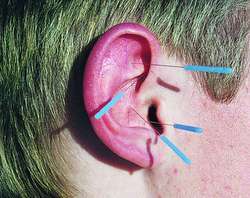 Examples of alternative practices include acupuncture and acupressure, homeopathy, osteopathy, chiropractic, massage, hypnosis, megavitamin therapy, pulse diagnosis, tongue diagnosis, iridology, rolfing, faith healing, and prayer. Forms of medical practice the bases of which have not been, or cannot be, subjected to rigorous scientific scrutiny, or which, when scientifically tested, are not found to be effective. Some forms of alternative medicine do not meet generally accepted criteria of rational validity. They include HOMEOPATHY, ACUPUNCTURE to treat disease, AROMATHERAPY, REFLEXOLOGY and IRIDOLOGY. Alternative medical therapies are commonly successful in the short term because of the therapeutic effect of human interaction and the expectation of results confidently predicted (PLACEBO EFFECT), but seldom have useful long-term effects. The reputation of alternative therapies has much to do with the psychological mechanism by which chance results favourable to a hypothesis are noted and remembered whereas those unfavourable are not. In late 2003 the British Government, alarmed at the proliferation of unqualified alternative practitioners, announced plans to regulate and control the practice of alternative medicine. See also COMPLEMENTARY MEDICINE. see complementary and alternative medicine.